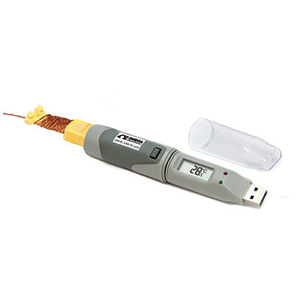 The OM-EL-USB-TC-LCD data logger measures and stores up to 32,510 temperature readings from either a Type J, K or T thermocouple which plugs into a miniature female thermocouple receptacle at the base of the unit. The data logger plugs directly into a PC’s USB port, no USB cable is required. Three different functions are available on the display, most recent logged temperature, maximum logged temperature and minimum logged temperature. The push button on the data logger is used to cycle through these functions. Data logger logging and alarm status is indicated by flashing red and green LEDs. Using the included Windows software, the user can easily set up the initial data logging parameters including thermocouple type, logging rate, start-time, high/low alarm settings, logging mode and desired temperature units (°C or °F), select the display mode which includes display off, on for 30 seconds after button press, or permanently on, data rollover (allows unlimited logging periods by overwriting the oldest data when the memory is full) and also download the stored data. The downloaded data can then be graphed, printed and exported to other applications such as Excel. Note: Comes complete with Windows software, operator’s manual on CD-ROM, protective cap, 3.6V lithium battery and Type K thermocouple.